We are aware of the reports regarding Joe Lefeged in Washington, D.C. At this time, we will have no further comment on the pending matter until we gain more information. Our second Colts Fan Fest last Thursday in Louisville was crazy to say the least. A tire problem, a long delay and quick-changing weather lead us to a long line of fans waiting with a beautiful view of Louisville’s skyscrapers along the Ohio River in the background. It was a hot afternoon, but the refreshing breeze and The Hunter Smith Band’s country music made the 90 degree weather bearable. Kentucky’s Classic Hits Station 97.9 FM was with us playing “Funky Town” from their tie-dyed VW van, as well as our local affiliate ESPN 680. Winners Choice Sports was also there providing fans nationwide with live streaming coverage of the event. This has been archived for fans to see if they were caught on camera at www.ihigh.com/wcs. Fans gathered and cheered as the red helicopter carrying Colts players Coby Fleener and Dwayne Allen arrived next to the Ohio River. Tiny, our 30-foot inflatable football player, welcomed them, while Blue, our mascot, gave them each a special handshake. Meeting the fans is very special to the Colts players. 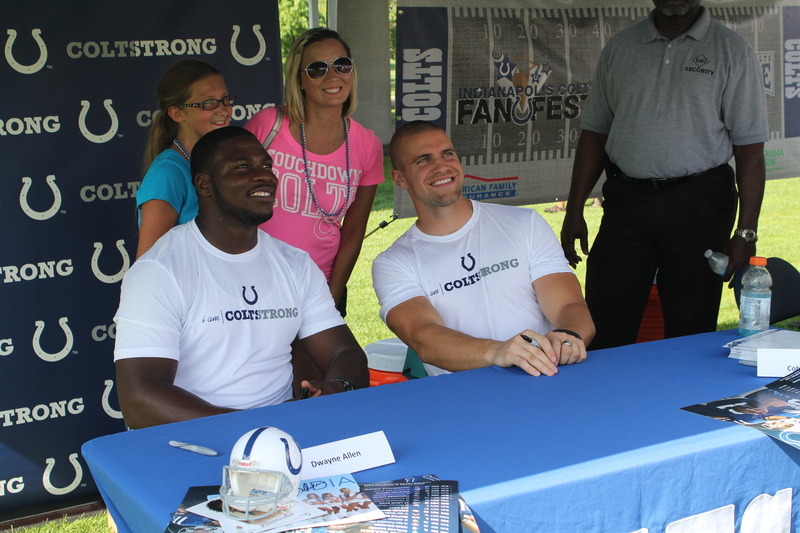 Fleener enjoys giving back to the fans by visiting with them at fun events like Thursday’s Fan Fest. “[The fans] support us. Ultimately, we play for them. Without them, we wouldn’t have a team or the Colts organization,” said Fleener. Colts players also enjoy signing autographs and taking pictures. Dwayne Allen loves signing autographs for fans, but he has gotten some crazy requests in the past. “In college, I signed a couple of babies. I didn’t feel comfortable doing it, but they really wanted me to,” Allen said. I talked to Patrick, 21, from New Albany, Ind. while he was waiting in line with one of his friends and his little brother. He contemplated bringing his dog’s collar for Allen and Fleener to sign, but rethought that idea because their autographs are too special to be slobbered on. Like many other fans, Patrick is looking forward to the Colts first preseason game August 11. He usually watches the game at the local Buffalo Wild Wings, but sometimes he prefers listening to the game on the radio. “I’m the kind of fan who yells during the game. I try to get the refs to hear me when they mess up,” he joked. 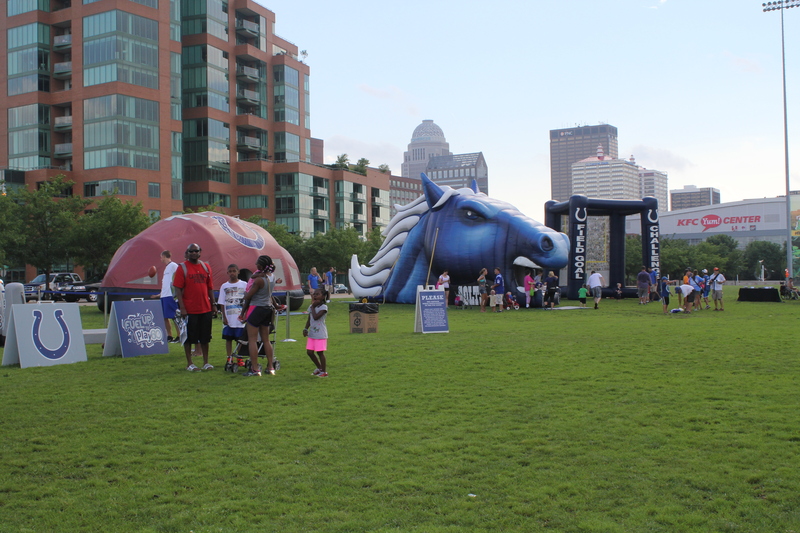 All of our fans had a great time walking around Waterfront Park wearing their new COLTSTRONG bracelets, carrying their Colts schedule posters and testing out their football skills at the Field Goal and Quarterback Challenge stations. We loved meeting all of our dedicated Colts fans in Louisville and look forward to doing this all again for our fans in Northern Indiana in a few weeks. We’ll see you July 12, Ft. Wayne! The choice of James wouldn’t have been the answer back in 1999 and Chappell recalls the draft where Bill Polian chose the Miami running back instead of Ricky Williams. “People were shouting at the TV in there,’’ Peggy Cseresznyes, a waitress at the time, told The Star April 17, 1999. “I didn’t really feel either way, but the guests didn’t agree with Bill Polian’s choice. After over 12,000 yards from scrimmage and four seasons over 1,500 (one of four running backs ever to do that), James is a staple on any all-Indy team. “Edgerrin was the complete back,’’ quarterback Peyton Manning told The Star in an email. “Run, block, catch; he could do it all. He was an extremely smart football player as well. I always knew I could count on him. “He was also the best teammate I every played with. Unselfish, accountable and tough as nails. I feel honored and privileged to say that I played ball with Edgerrin James. It appears that Jeff Saturday’s retirement from the NFL has caused the itch for the Pro Bowl center to get into the broadcast booth. Retired Indianapolis Colts center Jeff Saturday is positioning himself for a national broadcasting job, and he’s turning to one of the most high-powered agents to get an edge. Saturday recently signed a deal with New York-based IMG to help him find broadcasting and speaking jobs as well as potentially other commercial work. “It’s kind of rare that a former center would have that kind of personality,” Montag said of his newest client..
LIVE CHAT TODAY AT 11 A.M.
For this week, the Colts rookies have left the Indiana Farm Bureau Football Center and the offseason is truly upon us with players reporting to training camp four weeks from tomorrow. What questions do you have about the Colts with training camp starting on July 27th. This will be the second-to-last chat before training camp begins. We will have another one on July 19th and then once camp begins, we will move to a weekly chat. COLTS SOCIAL QUESTION AND ANSWER LIVE TODAY AT 3 P.M.
Today at 3 p.m., the Colts will host their first ever LIVE #Colts Q & A. What questions are on Colts fans mind with training camp opening up in exactly one month? Did you like what the Colts did this offseason? What are you most looking forward to at training camp?? Send whatever questions you have to the official Colts twitter account (@nflcolts) with the hash tag #ColtsSocialQA and your question could very well be read LIVE at 3 p.m.
Colts Fan Correspondent Casey B. (@ColtsCaseyB) and Colts.com writer Kevin Bowen (@KBowenColts) will be fielding your questions and you can watch the live question and answer at www.colts.com/live. Chappell’s second position series for all-time Indianapolis Colts, he takes a look at the running back position. He has five running backs for fans to pick from and this figures to be a bit more competitive than the quarterback debate. Chappell’s five candidates include Joseph Addai, Albert Bentley, Eric Dickerson, Marshall Faulk and Edgerrin James. Kuharsky takes a look back to the beginning of the offseason when he made his predictions for each team in the division. Now, it’s time to evaluate those decisions and here’s a look at how he graded out. The team made no effort to re-sign Johnson, who wound up with the Titans. Avery moved on to Kansas City and the Colts brought in Darrius Heyward-Bey, who looks to be an upgrade. As a league-wide initiative, NFL teams will now have to install permanent cameras in their home locker rooms in 2013. There are many things to weigh when deciding how to use the footage that is taken on game day, with the ultimate balance between revealing what the team is planning and at the same time providing unique content. To branch off yesterday’s article on Jeff Fitzgerald and his versatility at the linebacker position, here are some more comments from the Colts linebackers coach. “He’s football savvy so he has a pretty good idea. Now, it’s learning the terminology, understanding the type of techniques that we use, when and how we use those techniques. “What we saw on tape was a guy who could find the football, was able to get down in the box and do some really good physical, attack type of things, both in the blitz game and playing base, taking on blockers and doing that. In the first entry of Chappell’s all-time Indy Colts team, the pick was a no brainer in Peyton Manning at the quarterback position. The other nominees were Jim Harbaugh and Andrew Luck but this choice was a slam dunk as Chappell took a look at Manning’s final press conference in March, 2012. “This town and this team means so much to me,” Manning said. “It has truly been an honor to play in Indianapolis. I do love it here. Thank you very much from the bottom of my heart. Colts camp will head back to Anderson for the fourth straight year and Bremer takes a look at what type of team fans will see come July 28th. Bremer breaks down the camp schedule along with including some quotes from minicamp, one from quarterback Andrew Luck on where the offense stands heading into Anderson. Luck attended a football camp at William & Mary earlier this week, instructing young kids along with fellow NFL quarterbacks Russell Wilson and Matt Ryan. Luck also spoke with the camp attendees and offered some advice. The Colts quarterback looked back on his days attending camps as a child and recalled what he remembers. “I remember going to the Manning Passing Academy when I was a kid and watching Chris Carter run routes, it was like watching a beautiful opera, which had a big impression on me,” Luck said, referring to the former Minnesota Vikings receiver and current ESPN analyst. –Opening Day: Players will report to training on Saturday, July 27 with the first practice scheduled for Sunday. The first practice is scheduled from 1:50-4:30 p.m. on July 28th and is open to the public. Here is a link to a page from Anderson University on free admission into training camp practice, parking guidelines and other tidbits for those attending training camp. -Open Practices: The Colts have 15 scheduled open practices. Every afternoon practice from 1:50-4:30 is open to the public. Those will run daily starting Sunday, July 28th through Friday, August 16th except for the following dates. –Night Practice: The Colts will host a night practice inside Macholtz Stadium on Tuesday, August 6th from 6:30-8:55 p.m. Night practices usually garner the largest crowds of the three-week training camp. Players typically stick around after practice to sign autographs for those in attendance.